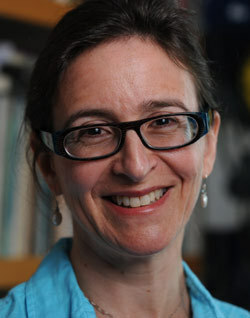 Susan Blum, my colleague at Notre Dame, is featured in a NY Times’ article today, Plagiarism Lines Blur for Students in Digital Age. The basic point of the article is that students, in the age of wholesale copying and pasting on the Internet, and a culture with changing notions of authorship, have trouble understanding the academic emphasis on doing one’s work (including writing one’s own words) and citing others for their ideas, data, and other types of work. Ms. Blum argued that student writing exhibits some of the same qualities of pastiche that drive other creative endeavors today — TV shows that constantly reference other shows or rap music that samples from earlier songs. In an interview, she said the idea of an author whose singular effort creates an original work is rooted in Enlightenment ideas of the individual. It is buttressed by the Western concept of intellectual property rights as secured by copyright law. But both traditions are being challenged. “Our notion of authorship and originality was born, it flourished, and it may be waning,” Ms. Blum said. Based on her research with Notre Dame undergraduates, Blum published an enticing book in 2009, My Word! : Plagiarism and College. Professors are reminded almost daily that many of today’s college students operate under an entirely new set of assumptions about originality and ethics. Practices that even a decade ago would have been regarded almost universally as academically dishonest are now commonplace. Is this development an indication of dramatic shifts in education and the larger culture? In a book that dismisses hand-wringing in favor of a rich account of how students actually think and act, Susan D. Blum discovers two cultures that exist, often uneasily, side by side in the classroom. Relying extensively on interviews conducted by students with students, My Word! presents the voices of today’s young adults as they muse about their daily activities, their challenges, and the meanings of their college lives… Blum suggests, the real problem of academic dishonesty arises primarily from a lack of communication between two distinct cultures within the university setting. On one hand, professors and administrators regard plagiarism as a serious academic crime, an ethical transgression, even a sin against an ethos of individualism and originality. Students, on the other hand, revel in sharing, in multiplicity, in accomplishment at any cost. Back in 2009, Susan wrote about her work in an article Academic Integrity and Student Plagiarism: a Question of Education, Not Ethics in the Chronicle of Higher Education. 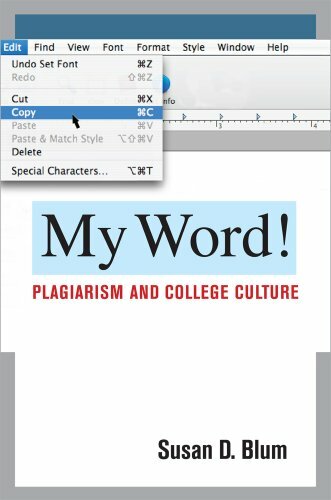 Susan outlined the two main approaches to preventing plagiarism, a moral one generally using honor codes and a disciplinary one requiring greater enforcement by faculty and staff. Traditional efforts by administrators to prevent plagiarism fail for a number of reasons. For starters, students have only a vague sense of what is meant by the moral quality termed “academic integrity.” Also, rules about intellectual property are in flux. In addition, our notion of the originality of utterance as the product of the unique, isolated, authentic self had its peak in the 1960s and 1970s. Students today have been immersed in a culture that revels in trying on different personae and sharing freely. There is no inviolable connection between words and the self that produces them. Students are not wedded to the integrity of their own writing and do not necessarily assume that others are either. Moreover, students are mostly focused on success and achievement, a bottom-line mentality that has helped them gain admittance to the highly selective institutions that are, in fact, trying to enforce the norms of academic citation. If students pursued education for its own sake — as do most professors — they would try to produce academic work that increases learning and to model their behavior on their professors’. But many students don’t especially value the process of classroom learning — so, in fact, any process will do. Treating academic integrity as a constellation of skills, taught largely through the long apprenticeship of higher education, is the most promising approach for getting students to follow the rules of academic citation, and the one with the least likelihood of providing a shortcut. That means teaching students what academic integrity involves, why professors value it, and how exactly to carry it out. I’m surprised that there’s no comment (here, though it may be in the article) about those times when pastiche *is* acceptable, and the reason why outright copy-paste plagiarism doesn’t live up to the form. Picasso’s chestnut that great artists steal only works when it’s deftly done. I’d put contemporaries like Quentin Tarantino and Mos Def’s producers in a different category than Jane Austen and Zombies, much less students who yank paragraphs for papers, precisely because the aim is to transform the known quantity with one’s own creative talent. It’d be interesting to see what you’d get if you *encouraged* students to mash up already-written works (citing appropriately, of course…) into pastiche pieces that reflect their creative take on the original ideas. Students would still have to engage with, learn from, and critically interpret those works – a goal that serves academic integrity… and actually might be even more important, in my humble. Christine, I’ve often thought the same thing, of what it would be like to create those sorts of pastiche, using the words of others. It’s acceptable, more or less, to tell a story using informants’ quotes and little else. But not quite so acceptable to do the same with sets of ideas and the like – there we have to write to prove it’s our own. Maybe you could create one of those pieces yourself! Unfortunately most of the comments on the NY Times article proved Susan’s analysis – either more discipline/punishment or students who better follow the honor code (with more individual rigor). They all insist that students know it’s wrong. But they don’t actually engage with what students might really be thinking and doing. It’s as if we think of other ways to handle plagiarism, then we are automatically condoning it. Not the case at all, and particularly not in Susan’s case! Still, they all recognized that it was a big problem, but just prescribed more of the same. I think you’re right on, we have to come up with new ways to think about how we approach scholarship, in particular writing, authorship, and citation. In the Heffernan piece, one of her comments was that blogging seemed calcified. But this is exactly the sort of space where different pastiches could be explored! Plagiarism is a manifestation of a general decline in respect for authority. For example, when Mayor Bloomberg’s (NYC) daughter was caught stealing from a store, she was cheating, ripping off society. This act is essentially the same act that students commit when they copy text from the web without proper attribution.